Today I feel so blessed that I got an opportunity to visit two rural villages in Maharashtra. We had been preparing for the day, the setting up of the toy library and the travel since a week now and today was the day when we were to witness the same. I was accompanied by two more interns and our mentor, Amruta. Honestly, I was a little apprehensive of going due to my poor health for a couple of days, but I am so glad that I made it, else the life lessons that I learnt today at the school probably would have been distant from me. The journey started at 7:00 A.M. in the morning from Dadar, so that we can cover the more than 100 Kms as early as possible to avoid the traffic and be there on school time. With 5 Cartons filled with more than 130 toys, I was impatiently waiting to reach the place and meet the kids. I did expect the environment and people to be very unprivileged but only the actual field experience can describe it how different it is than usually in words. We did take a short halt for breakfast and resumed to reach the destination only to witness joyous faces of little kids as well as the teachers. Toys for the day ! Ahh! Such a warm welcome that was, Gawli Pada. All the kids were so mannered and disciplined that I was ashamed of my own childhood when I felt like a pain to wish a teacher “Good morrrrning, Teacher” with the class. I do remember hiding myself behind the taller ones only to save the effort of standing up. But these kids were way more civilised than us, supposedly. There was a field coordinator from Impact India Foundation, Mr. Manoj Prajapati who accompanied us to this school and actively helped us in explaining the teachers, how to play the games and ways to conduct the play sessions. One by one we unpacked the toys and showed them how to play, and even the teachers were so delighted to see them, as they themselves never really had that kind of a childhood. 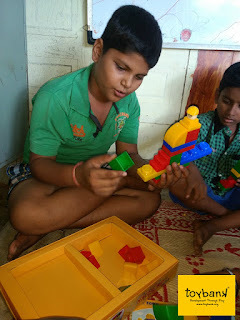 The idea was that the teachers understand the games thoroughly and then explain the kids during their play sessions. Meanwhile, Amruta was taking care of the paper work with the principle and soon we were done with all the games for Gawli Pada. Towards the end, we got hand of a Frisbee and started playing in the ground surrounded by classrooms, in the middle of the school. One by one all the kids of the school joined and the thrill on their faces made each of ours’ day! I have never had such a feeling of happiness and accomplishment and will never forget it. The Joy of giving, they say, is indeed the biggest one, and now I understand how so. Its truly a matter of experience. Then we wrapped up and left, with smiling bright faces waving us a good bye and wishing we come back soon. The next stop was a rather very remote village called Parali. The school there was majorly for the tribal kids. This school made me feel ashamed that all of us, every single person, even the person reading this blog, is way too privileged and blessed than we really deserve, where on one hand these people are fighting for their basic survival rights, like access to drinking water, clothes, food and sanitation, we crib each day about things like not so warm food on plate, soiled toilets, unironed clothes, inadequately salty meal or not so chilled drinking water! Many of the children were even victims of domestic violence as told by the teachers on our inquiry. The water that they used for drinking, that they obtained from a 500 meter far away well, was so dirty and filled with algae that not a single person of us would even use it to wash our dirty feet. They drink it each day! The crowd says it all. They loved the game ! A group photo at Parali Zilla Parishad School with our BITS interns. SMILE ! Here too we followed the same activities of sensitising the teachers and teaching them the games. Their cheerful and laughing faces was what that saved our teardrops from falling. All in all the events of this day made me think and rethink on many things in life and I am really thankful to Toy Bank that I was chosen for this job. Toys and Games all the way from Washington! 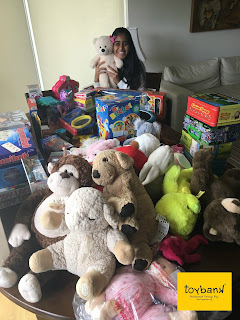 Toybank, an initiative under The Opentree Foundation, is an organization in India that promotes the Right to Play for all children, because a happy childhood defines almost every aspect of a child’s life and in turn the society. Founded in August 2004, our motto is to provide every economically-disadvantaged child an equal opportunity to education, achieved through healthy play and games. As of January 2018, Toybank has set up 276 Play Centers and impacts the lives of 43,009 at-risk children every day.